Professor John Yarnold studied medicine at Middlesex Hospital Medical School, University of London. 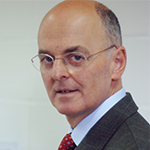 After several years of postgraduate training in general medicine, radiotherapy and oncology, he was appointed Senior Lecturer at The Institute of Cancer Research, London, and Honorary Consultant at The Royal Marsden in 1980, where he has remained. His clinical practice and research interests have concentrated on the role of radiotherapy in breast cancer and he has led 17 randomised clinical trials testing advances in treatment for cancer patients. The Royal Marsden, together with its academic partner, the ICR, is the largest and most comprehensive cancer centre in Europe and the only National Institute for Health Research Biomedical Research Centre dedicated solely to cancer. It’s a centre of excellence with an international reputation for ground-breaking research and pioneering the very latest in cancer treatments and technologies.